Especially when it’s a few rooms away. An adorable cartoon character voice suddenly becomes a burglar talking to his buddy. The race car with the built-in crash sound becomes your door being pried open. └ Tags: kids, toys, what was that? 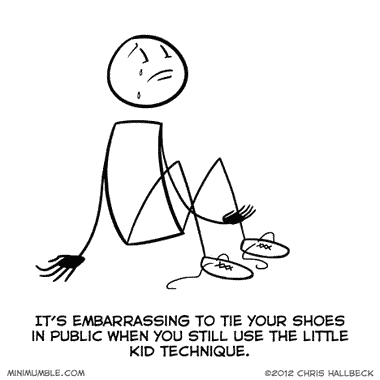 Did you event try to tie your own shoes? Let me see you try. Well you don’t need to throw things! Just calm down! Here let me do it! How did you even become manager of this bank without this skill? My son really likes to dance and sing along with music. A lot of pop songs contain brand new words that he has never heard before. 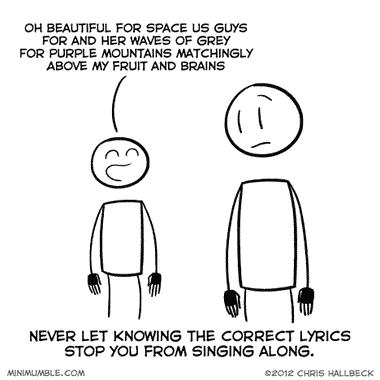 This doesn’t stop him from approximating the sounds a syllables with made up lyrics. Most of them are hilarious enough that I can’t stand to correct him. He will be embarrassed at some retro music party when he’s in college. Also, Hugs Bison shirts are once again back in stock! 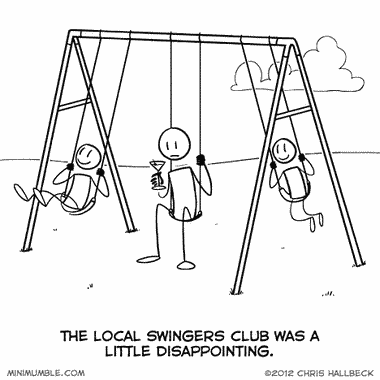 We had a fairly lightweight swingset in my backyard. My brother and I were convinced we could tip it over if we synchronized our swinging just right. Fortunately we never did but it’s funny now thinking back on how we thought that was a good idea. 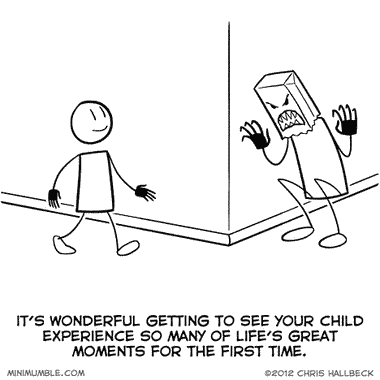 It’s amazing to be there seeing your child experience new things and concepts for the first time. It’s funny how there’s a lot of hype over having to tell your kids about stuff like “the birds and the bees” or the death of a pet. In reality there are thousands of concepts like that you get to introduce. A few weeks ago we were talking and he asked “What is the future?” That question triggered so many things in my head that I just sat there and stared into his eyes overwhelmed with the contrast between the information inside me and his anticipation in hearing it. Also, Look! It’s Biff’s 6th birthday! Woo! To celebrate all Biff books are just $6!